Google’s subsidiary Alphabet’s Incorporation’s (GOOGL) artificial intelligence (AI) is working on reducing data consumption with the help of image compression technology called RAISR (Rapid and Accurate Super Image Resolution). The motive is to save your valuable data and load high-quality images by using lesser data. Sadly, the technique is limited to Google+ for now. Thanks to RAISR technology, you will be able to save as much as 75% of mobile data without having to compromise on content quality. RAISR gathers and analyzes images and then creates a duplicate of those images by using a fraction of the pixels from the main image. However, in the process, the quality of the picture is not compromised. The new machine learning technology – RAISR was first showcased by Google in November and is now being utilized by Google+ images on Android devices. RAISR’s algorithms enable Google+ to fetch HD images with low file size and high resolution. RAISR technology sure looks desirable as we all would love to get high-quality images on lesser data usage. But, who uses Google+? We expect Google to bring RAISR technology for other apps soon. It is worth mentioning that Google is not the only one who is looking for methods to lower down data consumption, even Twitter is working on it. In June, Twitter took over an AI startup – ‘Magic Pony’ that provides a similar algorithm and it also applies the same tech for videos. 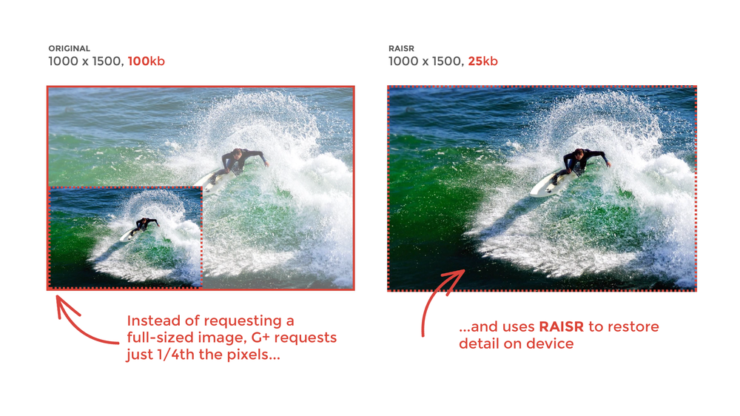 With RAISR, Google claims to be upscaling over a billion of images every week. Google has hinted that it will roll out the technology more broadly in the coming weeks. It is not yet clear whether Google will implement it in Chrome browser too, as that would be super helpful for the users who explicitly rely on mobile data. We really hope Google brings it to other apps soon, such as Google Photos.